Limited pressing of 150 cassettes. Nolan The Ninja's debut Producers I Know beat tape ''lo-fi loops'' pays homage to the gritty beat tapes made on cassette throughout the late 80's to the late 90's which were played in car stereos and walkmans all while representing a new generation of producers and beatmakers who listen to these same style of grimy, lo fi beats in mp3's or WAV formats on handheld devices streamed or streamed on Bandcamp & Soundcloud. 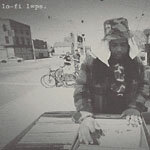 ''lo-fi loops'' represents the intersection of the past and the present day while being focused on pushing things forward well into the future. 10 slaps. 33 minutes of pure, raw, uncut, instantaneous headnod inducing instrumental Hip Hop.